If you plan on visiting Italy in summer and you order a caffe shakerato from the menu, you might want to know you just ordered a frothy, cold coffee drink. And, if you are in a bar, you might get it served spiked with Baileys Irish Cream or a coffee liqueur. Italy has a unique coffee culture. There are coffee customs and times to drink different coffee drinks. Caffe Shakerato is a refreshing, lightly milky drink that can be enjoyed throughout the day. While Americans and Brits enjoy their cold brews and iced lattes, Italians are whipping up something a little more extravagant. What Is a Caffe Shakerato? 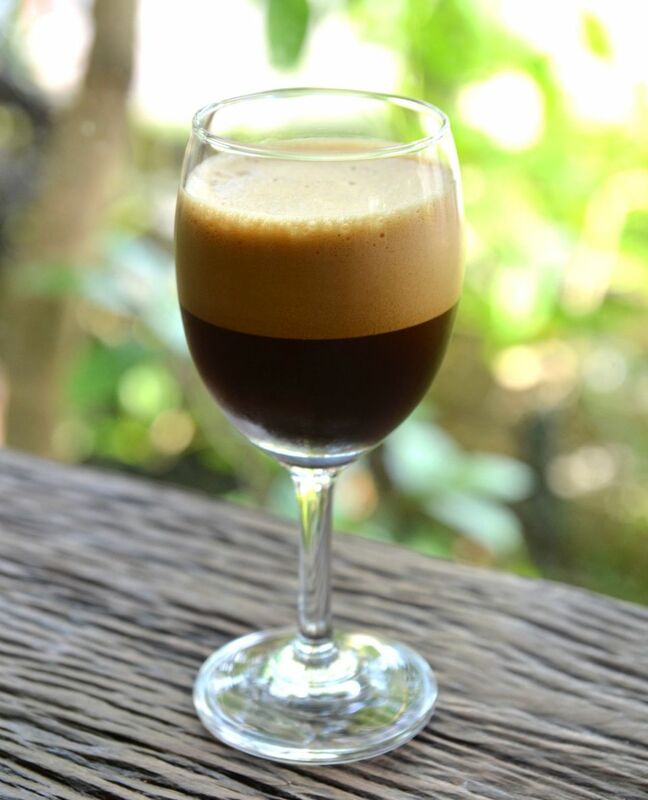 In its most simple form, a shakerato (pronounced like it looks, caf-fay shak-er-a-to) is made by combining freshly made espresso, simple syrup, and lots of ice, then shaking it vigorously until a froth forms when poured. It is usually strained while being poured into a martini glass or another stemmed glass. Italian bars, especially those that are on the fancier side, will take your standard shakerato and do it up even more. For instance, you might get a wine glass lined with a spiral of chocolate syrup before the frothy coffee is poured in. Some places may add or substitute vanilla gelato for the ice, while others add cream or booze. Martini glasses or champagne flutes are the traditional glassware used for a shakerato. For your special variations, you can garnish it with a coffee bean or dust the glass rim with cocoa powder. You may even top it with a tower of whipped cream. If you don't want to add cream or coffee liqueur, but you want to booze it up, consider adding rum, sambuca, or amaretto. During the summer, shakeratos can be found in coffee shops, hotels, restaurants, and some bars. If you like to discover a place with your eyes and your stomach, consider booking a foodie-centric walking tour of Rome. Not only will you be able to taste an icy shakerato, but there will also be gelato, pizza, caffe freddo, which is cold, sweet coffee that can also be iced or frozen, and other Italian delicacies. If you do not plan to make a visit to an Italian cafe anytime soon, you can make a shakerato at home. The main ingredients are freshly made espresso, ice cubes, and simple syrup. Other additions include coffee liqueur, orange or lemon twist, or a few drops of vanilla extract. Instead of simple syrup, you can use plain sugar, but make sure to dissolve the sugar granules in the hot espresso before you add the ice or else the sugar will not dissolve. Fill a cocktail shaker halfway with ice cubes, and pour the espresso over the ice. Add sugar or simple syrup. Add vanilla syrup or vanilla extract. For an alcoholic kick, add a shot of your choice. You can toss in a lemon or orange twist and shake vigorously for 10 to 15 seconds. Strain into a cocktail (martini) glass or champagne flute. Presto, you have yourself a shakerato, just like in Italy.